Keller, TX - 5 REASONS TO QUIT SMOKING TODAY! 5 REASONS TO QUIT SMOKING TODAY! 5 REASONS TO STOP TODAY! Did you know that there are more than 36 million smokers in the United States, according to the Centers for Disease Control. This amounts to around 15 percent of the population. While this number has declined over the years, it’s still a large number of people who are at risk for dental issues that come with smoking. Yellowed or stained teeth is one of the most obvious signs that someone is a smoker. The chemicals in tobacco cling to the enamel in your teeth, causing them to stain over time. Teeth whitening treatments can help slow down this process, but if you continue smoking it’s impossible to stop or reverse it entirely. The old saying “your breath smells like an ashtray” definitely holds true with smokers today. Cigarette particles remain in the mouth long after a cigarette is finished, which cause the breath to take on the characteristics of a cigarette. Beyond that, the longer-term effects of smoking also contribute to bad breath. The overgrowth of bacteria in the smoker’s mouth leads to horrible breath. Unfortunately, amount of brushing or gargling with mouthwash will get rid of the smell because it is coming from gum disease, oral sores, and decay. The only real way to turn things around is to stop smoking entirely and work with a dentist to address the underlying issues it caused. Prolonged smoking can also lead to inflammation of the salivary glands, which results in painful swelling in the face and could require surgery if salivary gland stones develop. According to the CDC, smokers are twice as prone to gum disease as nonsmokers. The risk increases with every cigarette you smoke, and gum disease treatments do not work as well on smokers. Why is this? Smoking decreases your mouth’s ability to fight off bacteria, which allows it to build up on teeth and eventually make its way to the gums. If left untreated, gums can pull away from teeth and cause the underlying bone structures to weaken. The most severe form of this is periodontitis, where the bone and tissue holding teeth in place break down, causing teeth to fall out or be extracted. 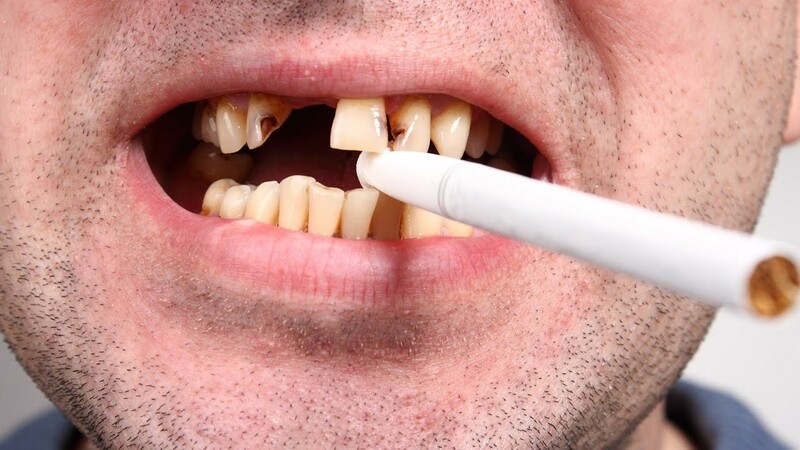 Losing teeth is an outcome for heavy smokers because their mouths don’t get a break long enough to heal. Smoking also counteracts the effects of gum disease treatments like brushing, flossing, prescription mouth rinses, and tartar removal treatments. Unfortunately, the bad news does not end there for smokers. Not only does smoking increase your risk of things like tooth extraction and oral surgery, it also slows down your body’s ability to recover from these procedures. It also lowers the rate of successful dental implant procedures. The more time your mouth spends in a vulnerable state, the more prone you are to developing further complications. A dentist can help mitigate this as much as possible, but treatment plans are only so effective if the patient continues to smoke. The most severe form of smoking-related mouth issues is oral cancer. According to the Oral Cancer Foundation, about 50,000 people in the U.S. are diagnosed with oral cancer each year and an estimated 80 percent of them are smokers. The risk of developing oral cancer increases when smoking is combined with heavy drinking. Oral cancer begins as a white or red patch in the mouth accompanied by difficulty chewing or swallowing, numbness in the jaw, and even pain in the ear. While there are certainly other causes for these symptoms, the National Institutes of Health recommends that anyone who has these symptoms for more than two weeks should see a doctor. The earlier cancer is detected, the more effective treatment will be. Again, a dentist can put together a treatment plan to help mitigate the issues associated with smoking, but the only way to make them go away completely is to stop smoking. Dental issues are just one of the many parts of your body that can be affected by smoking; quitting will ensure a healthier life for years to come. Call our office today at 817-741-0045 so we can help!